Social Media: Friend or Foe? We have all been on both sides of the fence on that question, especially working in the apartment industry. Social media can be a fantastic way to showcase your property’s culture and personality, while sharing images of your amenities and happy residents. However, it can also be overwhelming to keep up with finding new and exciting material to keep your audience engaged. Below we have some tips on running your property’s social media like a rock star. The best platforms for apartment industry social media are Facebook, Instagram, and Pinterest. *Facebook is the mother-ship of all the social media platforms and its paid advertising tools are extremely valuable. With Facebook ads you can target people that have just moved to town, people that are talking about moving to town, people of any age group, interests, the list goes on and on. Facebook also targets a wide range of potential residents including baby boomers and older generations that have not adopted other social media platforms. *Instagram is very popular with the 18-29 age demographic. It is also a much easier platform to keep up with. Posting images of your property, decorating ideas, employee spotlights, and images of your city are great ways to keep followers engaged. You can also search popular hashtags and use them during relevant times. If you are an apartment community in Austin, Texas during SXSW, a popular music festival, you will want to post content aimed at the festival goers by using the SXSW hashtag. *Pinterest is a great tool used to drive people to your website and other accounts. An example of a property management company doing a great job on Pinterest is AMLI Residential Apartments in Austin (and other various locations). You can check out their account HERE and see examples of great board ideas. Once you decide which social media platforms you are going to use you will need to hash out a plan for your content. Content consists of pictures, articles, contests, videos, and any other media that will engage your fans and followers. Even posting your open leasing professional and maintenance professional positions can be content geared toward individuals looking for a job in the apartment industry. * Contests for residents (for example take a photo of a spot on your property and leave an envelope there with a note saying “you won! come to the leasing office to claim your prize!”). Encourage your residents to follow your accounts so they can win prizes, get creative! * Articles that effect your residents and potential residents such as local news, apartment decorating, and other relevant pieces. * “Song of the Day” music videos that your staff can have fun curating. * Hosting an open house for potential residents that you can use targeted Facebook ads to promote then take pictures to use for content after. You can also partner with a catering company and DJ to have them cross promote on their social media accounts. The most important move you can make when developing your social media is to check in monthly and see what is working and what is not. There are many programs, such as Hootesuite and Facebook Analytics, that will give you feedback on what content is getting you the most attention. Keep a monthly spreadsheet with what is working and tailor your content towards that. It will always be changing, so it is important to stay on top of it regularly. Social media in the apartment industry can be very fun and rewarding. Don’t put it on the back burner, let it become a priority and enjoy all the benefits that come with great social media! Polish Your Social Media Profiles! When used correctly, social media can be a valuable means of networking—especially during a job search. However, if you are sending the wrong message with your social media profiles it can damage your career. Your personal brand is a culmination of the persona you broadcast across your social media. While you may not purposefully construct an online image, viewers of your profiles are nonetheless putting one together as they read what you put online. Begin building a personal brand by being purposeful with the information you put online. From pictures to postings, stick to conveying the best, most professional version of you. Consistency across all profiles will strengthen your image, and give potential employers or connections a chance to understand what you are about. One of the quickest ways to create an unpolished profile is to have incomplete information. Understandably, you may not want to disclose everything about yourself online; however, filling in your professional information will help with networking opportunities. Additionally, if you are applying for jobs and an employer checks out your profiles only to see that they are half filled out they may suspect that you have something to hide. 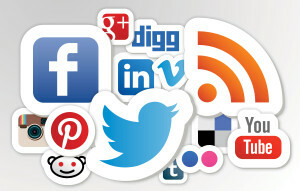 Maintaining complete, up-to-date information on your social media outlets is the best way to make the most of them. If you don’t have any social media profiles, now is a good time to sign up! Facebook, Twitter, and LinkedIn are all beneficial for professional networking. Perhaps you are a social media veteran, with profiles you have updated for years. In this case polishing your profiles means combing through all of your information and photographs to remove anything that could be construed as unprofessional. When looking through everything you’ve uploaded keep in mind the message each article of information is sending, and strive to convey your best, most professional self. With more and more employers checking out job applicants online, one of the easiest ways to take yourself out of the running for a position is to have unprofessional, insensitive, or sloppy pictures or posts online. Social media is a powerful tool when used correctly, and polishing your profiles will set you up for career-building success. If you have a LinkedIn account you can use it to complete the majority of your online professional networking. Because LinkedIn is geared for a professional audience, it will be the first place potential or current employers check you out online. Maintaining a complete and up to date LinkedIn profile is becoming common courtesy in the social media world of business. Beyond LinkedIn, other social media platforms such as Facebook and Twitter can be useful for your career. There may be other industry-specific social media sites that could also benefit your online presence, but starting with the most common is a fail-proof method. Depending on your position and industry, your social media profiles should ideally communicate who you are professionally and resonate with your target audience. For example, if you work in the apartment industry, finding ways to demonstrate that you know the latest industry-trends, or are passionate about your work could go a long way. A complete makeover may be necessary in some cases if your social media account was created prior to beginning your current position. Consistent and regular updates on social media outlets are received much better than sporadic ones. The process of building your online brand can be accelerated through consistent updates. As you post regular updates your audience will come to expect when you will communicate with them and is more likely to become engaged. Following individuals and companies who are experts in your profession is another way to establish the online aspect of your career. If you are in the apartment industry this could be anyone from cutting-edge properties, high-powered individuals, or popular speakers. In addition to following them, actually interacting with these accounts online can also give your reputation a boost. Navigating the world of social media for career purposes can be a daunting task. While building a successful online presence may take time, rather than a magical formula, these steps can ensure the process is beneficial.